Transform your wooden staircase, adding style and comfort, as well as manageability for all ages using your stairs. Great for older pets who struggle with stairs also! Available in 6 colors/styles - ask for free carpet swatch samples if required. Tread Comfort FLAT Padded Adhesive Carpet Stair Treads are sold in 3 packs and 12 packs. Adhesive backing enables easy and quick installation, taking just a few minutes to complete an entire staircase. 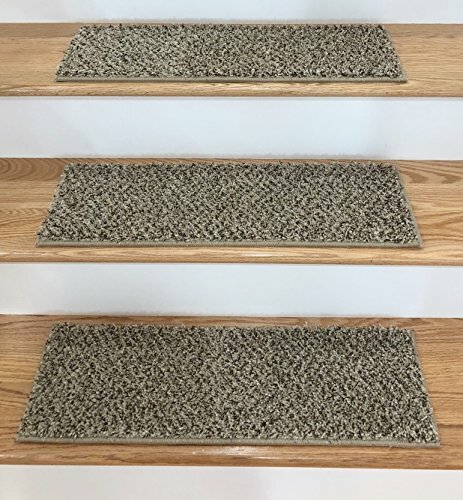 Padding is built in so that these stair treads are durable, safe and comfortable - WE DO NOT SELL STAIR TREADS WITH HARD UNFINISHED BACKING THAT WILL DAMAGE WOODEN STEPS WITH SCRATCHING OVER TIME. Made from high quality carpet, with high-quality surged edges (NO LOW-COST TAPE EDGING USED). No Pilling. No Fuzzing. Stain Resistant. Proudly made in the USA. See diagram for sizing details. Please enquire if custom sizes are required. We offer a great selection of Rugs, Runners and Landing Runners to coordinate with your stair treads. Custom sized rugs and runners are available. All rugs and runners have a small amount of our specially formulated release glue around the edges so they stay in place on any hard surface flooring - no need for rug grippers or rug pads for extra comfort. Transform your wooden staircase, adding style and comfort, as well as manageability for all ages using your stairs. Great for all pets who struggle with stairs also! Available in 6 colors and two styles - contact us for FREE CARPET SWATCH SAMPLES if you can't decide. Adhesive backing enables easy and quick installation and removal, taking just a few minutes to complete an entire staircase, the adhesive will not damage your floor. Padding is built in so that these stair treads are durable, safe and comfortable. Made from high quality carpet, with high quality surged edges (NO LOW-COST TAPE EDGING USED). No Pilling. No Fuzzing. Stain Resistant. Proudly made in the USA. WE DO NOT SELL STAIR TREADS WITH HARD UNFINISHED BACKING THAT WILL DAMAGE WOODEN STEPS. If you have any questions about this product by Tread Comfort, contact us by completing and submitting the form below. If you are looking for a specif part number, please include it with your message. By D DEAN FLOORING COMPANY, LLC. By Peak Products USA Corp.